We have just taken a look at the CM Storm Scout 2 Mid-Tower Chassis. This case has a lot of features geared for the gamer and if you need things like great cooling, secure peripherals and more, it's worth checking out. This is a great case that is one of my favorites to build in and after you read our review, I think you'll understand why. Take a look here. The CM Storm Scout 2 Advanced Mid-Tower is constructed from high quality steel and plastic. The plastic parts of the chassis are very sturdy and do not flex. The side panels are the most rigid of any case that I have seen so far. It has a flawless finish inside and out and has all interior edges rounded. Please post your thoughts, comments and questions right here. We have just posted our review of the Lian Li PC-7HX Mid-Tower Chassis. This follows Lian Li's all-aluminum requirements and is a very nice case with traditional cleans lines and enough features to satisfy most people. It is built very well, and has some layout ideas that make it work for even super-long graphics cards. There is a lot to like, so check out our review before you go spend your money. Today we have a brand new product from Lian Li on our bench - the Lian Li PC-7HX mid-tower case. Lian Li is a well-known manufacturer of PC components that include, PC chassis, power supplies, storage (HDD enclosures) and some laptop accessories. They focus on making high quality products - not just more of the same old steel and plastic that everyone else makes. We are looking at the PC-7HX today and are somewhat impressed. Please post your thoughts and comments for Cottonmouth right here. We have just taken a look at the CM Storm Recon gaming mouse. This mouse is a mid-level gaming mouse that has quite a few features for the price tag and seems to track very well on pretty much everything we tried it on. If you are looking for a new mouse, you should check our review for all the details. The Recon Optical mouse with its new Avago Sensor was a pleasure to use. I had no problems with it being jerky or skipping around regardless of what surface I was using it on. It is constructed well from high quality components and the Teflon feet did not show any noticeable sign of wear after a month?s use. The Teflon feet did a great job of being smooth on any surface I tried it on. 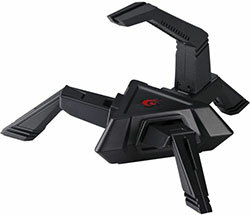 We have just taken a look at the CM Storm Speed-RXL Pad & Skorpion Mouse Bungee. These are a couple of products that will be handy for every PC gamer to enjoy. The Speed-RXL is a cloth pad that offers great movement, easy cleanup and more. The Skorpion Mouse Bungee is one of the handiest things we've used to keep our mouse cord in place. The best news is that both of these can be found for under $20 each. Check our review for all the details. The CM Storm Speed-RXL mouse pad with the Duracloth surface was a pleasure to use. Its large surface area is great for gaming and cleans up easily. That being said, even with the few weeks that I had the pad, I could see signs that the edges were stating to fray. As the pad is made from rubber and cloth it could get damaged if you don?t take good care of it. . . Please post your thoughts and comments right here. We have just taken a look at the Crucial Ballistix DDR3-1866 8GB Memory Kit. This kit offers a performance boost over many of the standard kits out there and it does it for a bargain price. If you're looking for a great kit of memory, from a company you can trust, Crucial (a division of Micron) has been around long enough to know how to deliver good memory. Check our review for all the details. The samples they have sent us are the Crucial Ballistix Elite Series DDR3 PC-3 14900 @ 1866MHz. This kit features 2?4GB that have 9-9-9-27 1T timings @ 1.5Volts. This is achieved via the XMP (eXtreme Memory Performance) profile on Intel systems. If you use this memory on an AMD-based system, you may have to specify the XMP settings in the BIOS. Please post your comments, questions and feedback for Cottonmouth right here. If you've ever fired a potato gun, a t-shirt canon or even shot a spitball through a straw, you've enjoyed some pneumatic powered projectile action. Check out this canon that actually fires cars. Yup, cars. Your link does not work! I believe you left out something. I would like to check it out. I wasn't sure where to post this, So here goes. I would like to wish all the peeps at BCCHardware a safe and Merry Christmas. Suggestions, Feedback & Bugs / Jasofina! The website was spammed by some moron with in-appropiate ads.. the best way I know to say it. I know BCC does not approve of this. Who-ever he is need to be removed from users along with all his posts. Jasofina.